GBPAUD is recording the third day of losses after a failed attempt to break significantly above the 1.8340 resistance level last Friday. Chances for a short-term reversal are increasing as the price is dropping below the 20-day simple moving average (SMA), while the technical indicators have a steeper negative slope now. The RSI is heading towards the neutral threshold of 50, while the stochastic is moving down after the bearish cross within %K and %D lines. 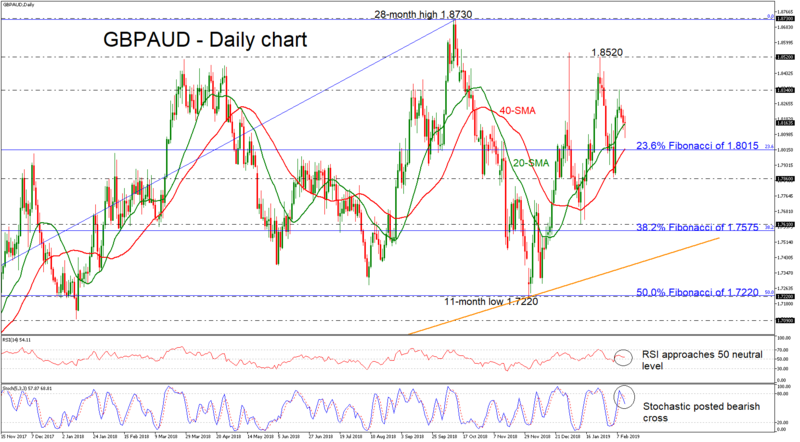 Should the price retreat further, the 23.6% Fibonacci retracement level of the upward movement from 1.5725 to 1.8730 near 1.8015, which coincides with the 40-day SMA. Moving lower, the focus would shift to the 1.7860 support area, while lower still, a violation of this barrier would increase speculation that the near-term bullish phase has ended. To the upside, the price could turn attention to the 1.8340 latest high. Further up, the area around 1.8520 comes into view before pushing prices until the 28-month high of 1.8730. Overall, GBPAUD has been trading within an upside rally since October 2016, creating higher highs and higher lows during this period.